We were fortunate enough to attend the opening ceremony at the iconic Carrara Stadium, home to the Gold Coast Suns AFL team. It was a spectacle packed with colour, world-class choreography and a detailed history of what it is to be Australian. The 35,000 capacity arena was sold out, the spectators made themselves heard and even though rain threatened to derail the start of the live coverage, it did not dampen any spirits. The pace of the evening kept everyone on the edge of their seats and there was no moment for anyone to catch their breath, from singing, to dancing, to tributes and interview there was always something interesting going on. Perhaps one of the most-loved elements of any opening ceremony is when the competing athletes parade around the track under their country's flag. It was fascinating to see some of the smaller nations and territories that had come to the Games to compete for those 275 Gold medals. 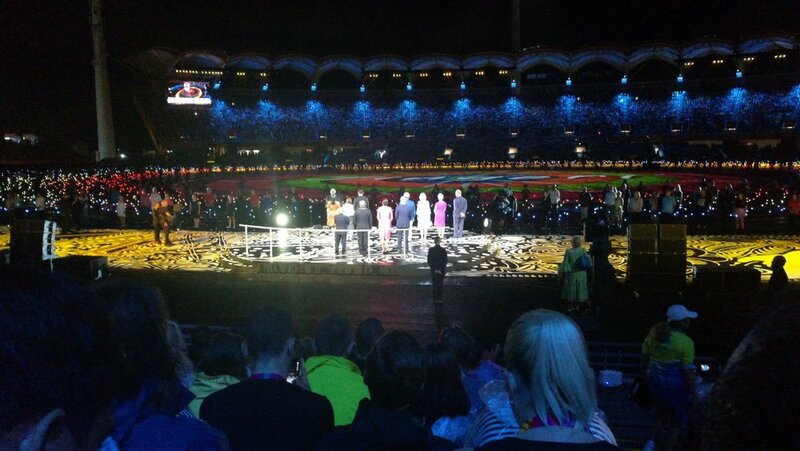 Unsurprisingly Team Australia stole the show with their record turnout of 473 athletes. Team England weren't too far behind but the passionate crowd roared their local heroes all of the way round. To top the evening off, the Games were officially declared open by the Prince of Wales, representing the Queen, the head of the Commonwealth. Now into Day 2 of these Games, we have already seen some great stories developing and some surprises, thrown in with some shocks. From a Team England viewpoint, the two Brownlee brothers missing out on medals in the Triathlon was a nightmare start but currently they are sitting pretty at the top of the medal table.